Newport’s Towle School will be closed. The building will no longer be the elementary school for fifth and sixth grades starting with the 2016-2017 school year. 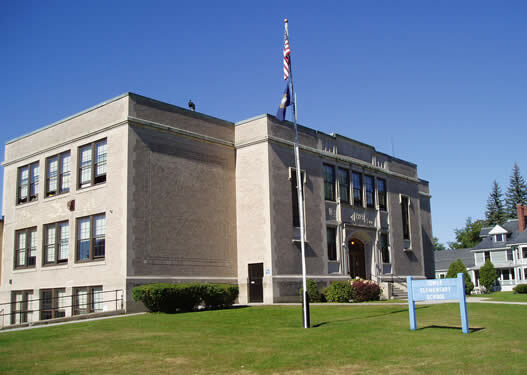 The Newport School Board voted unanimously to move fifth graders to Richards School and sixth graders to the Newport Middle High School. The vote came after a public comment session where only Kurt Menich expressed his desire to sell the building and use the proceeds for a gym at Newport Middle High. Towle school gym is the only school that houses a regulation size gym. The gyms at Richards Elementary and the Middle High School are both 3/4 size and cannot accommodate basketball games.No plans for the building were discussed, but Finance Manager Terry Wiggins said shutting the building down will save money. The Administration has until April 15 to notify all certified staff if their positions will be lost. This entry was posted in education, Newport, news, NH on March 31, 2016 by GrowingInArt. I grew up in this town and to send 6th and 7th graders to the high school is so beyond ridiculous! This is dumb if you ask me. Richards elementary school gym is still brand new and huge. Keep the school up and running and just work on the high school gym. To many people are going to loose their job. This school has been here longer than most of you guys. This is historic and its wrong to sell history from that town. The school board has two new members elected last month. The Selectboard make a $1,000 a year..